Imagine Pete Rose in a Cardinals lineup with Ted Simmons, Keith Hernandez, George Hendrick and Garry Templeton. The Cardinals did. They tried to make it happen. 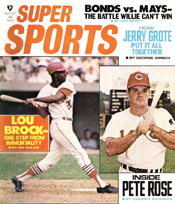 The catch: Rose likely would have been brought in to replace Lou Brock, relegating the popular Cardinals standout to a reserve role. In November 1978, Rose left the Reds, his hometown team and the only one for whom he had played since entering the majors in 1963, and became a free agent. Five clubs _ Cardinals, Phillies, Braves, Pirates and Royals _ were finalists in bidding to sign him. Rose chose the Phillies, even though the Cardinals and the others made more lucrative offers. On Dec. 14, 2015, baseball commissioner Rob Manfred denied a request to reinstate Rose, who was banned from baseball in 1989 for misconduct related to gambling. In 2004, Rose admitted to betting on games during his tenure as Reds manager. This is the story of how the Cardinals, determined to become contenders after finishing 24 games under .500 in 1978, wanted Rose, 37, to bring his hitting, hustle and hubris to St. Louis. Before the December 1978 baseball winter meetings began in Orlando, Rose met with Cardinals owner Gussie Busch, general manager John Claiborne and manager Ken Boyer in St. Louis “with the hope the Cardinals might be able to land a man who certainly would fit the type of offensive player so sorely needed by the Redbirds,” The Sporting News reported. Rose, who started at third base for the 1978 Reds, likely would have played left field for the 1979 Cardinals, joining an outfield of Hendrick in right and Tony Scott in center. Simmons was the St. Louis catcher. The infield for the 1979 Cardinals was Hernandez at first, Ken Oberkfell at second, Templeton at shortstop and Ken Reitz at third. Brock, the stolen base champion and future Hall of Famer who had sparked the Cardinals to three National League pennants and two World Series titles, had experienced a miserable 1978 season, batting .221 with no home runs and 12 RBI. He would turn 40 in 1979 and there were doubts whether he could be an effective everyday player. In the book “The Lords of the Realm,” author John Helyar wrote that Busch talked with Rose about being a Budweiser spokesman and also discussed a distributorship. The meeting occurred at a St. Louis hospital, where Busch was preparing for hernia surgery. “I probably would have had a hernia, too, if I had to carry all the money he was offering me,” Rose said. Indeed, Rose said the Phillies’ offer was lower than the bids of the Cardinals, Braves, Pirates and Royals. “There were five bids and I took the lowest one,” Rose said. “Being conservative, I could have gotten at least another million and a half. The Phillies initially offered Rose a three-year, $2.1 million contract _ an average of $700,000 per year. When they sweetened the deal to $3.2 million for four years _ an average of $800,000 per year _ Rose accepted. He said his friendship with Phillies players Larry Bowa, Greg Luzinski and Mike Schmidt also persuaded him. Royals owner Ewing Kauffman had made an aggressive bid, “but Rose has insisted all along he is a National Leaguer and what he lusts after most is Stan Musial’s record for hits in that league,” The Sporting News reported. If Rose had selected the 1979 Royals, he would have played that season for manager Whitey Herzog. The Braves thought Rose would pick them. Team owner Ted Turner offered Rose $1 million per year for “three years, four years, five years, whatever you want,” Sports Illustrated reported. The contract Rose got from the Phillies made him baseball’s highest-paid player. “$3.2 million for a leadoff man, ye gods!” wrote Atlanta columnist Furman Bisher. The Cardinals would finish ahead of the Phillies in the NL East in 1979. The Cardinals were third at 86-76 and the Phillies were fourth at 84-78. Rose had a spectacular 1979 season, collecting 208 hits and batting .331. He finished second to Hernandez (.344) for the NL batting title. Rose led the league in on-base percentage (.418), edging Hernandez (.417).